The grapefruit is a large, round citrus fruit 4 to 6 inches in diameter when ripe. The flesh ranges in color from yellow to pink to red, while the flavor ranges from very tart to sweet. Grapefruit is an excellent source of vitamin C.
The fruit should be firm yet give slightly when gently squeezed. Avoid fruits with soft spots or those that feel light for their size, as this is an indicator of a high pith to flesh ratio. Grapefruit is usually eaten fresh by slicing the fruit in half and scooping out the segments with a spoon or grapefruit knife. The fruit makes an excellent addition to salads and salsa; grapefruit juice is comparable to orange juice though generally not as sweet. The grapefruit's rind is mostly yellow, with tinges of green or pink. The flesh is segmented and acidic, varying in color depending on the cultivars, which include white, pink and red pulps of varying sweetness. Choosing: When buying grapefruit, select specimens that are smaller, thin-skinned, and heavy for their size. Rough, ridged, or wrinkled skin can also be an indication of thick skin, pulpiness, and lack of juice. Buying: Grapefruit are widely available at supermarkets, but check out local farmers' markets and fruit stands for better quality and lower prices. Procuring: The U.S. is the top producer of grapefruit, followed by China and South Africa. Grapefruit ripen completely on the tree. They can be left hanging on the tree for up to a year before harvesting. Fresh grapefruit halves are refreshing at breakfast, for a snack, or as a first course before dinner. Grapefruit that has been lightly sprinkled with sugar and broiled makes a pleasant, old-fashioned dessert. Grapefruit sections can be added to fruit or vegetable salads, paired with avocado, or served as a complement to seafood salad. Grapefruit skin can be candied or used to make marmalade. Grapefruit is an excellent source of Vitamin C. One serving provides 80% of the recommended daily value for adults. Half a grapefruit or ½-cup of grapefruit sections provides 1 serving from the fruit group of the Food Guide Pyramid. Grapefruit knives are small with a unique curved serrated blade, designed to hug the curves of the grapefruit. This is used to separate the outer edge of the segments from the rim of the fruit. Cleaning: Just rinse, peel and eat. Fresh grapefruit may be left at room temperature in a well-ventilated area for up to a week or kept up to 6 to 8 weeks in the crisper of a refrigerator. Exposure to ethylene gas from other ripening fruits may accelerate decay. 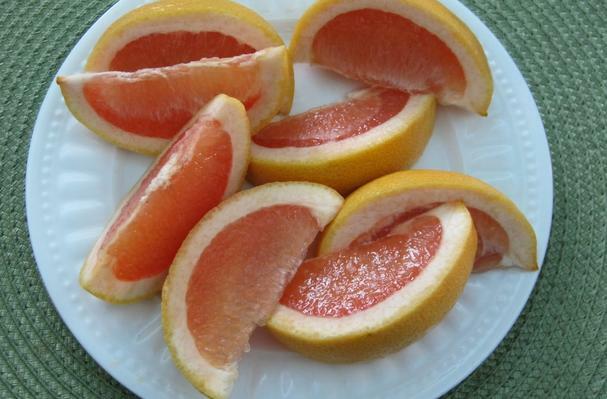 History: The grapefruit is an 18th-century hybrid first bred in Barbados. When found it was named the "forbidden fruit"; it has also been misidentified with the pomelo or shaddock, one of the parents of this hybrid, the other being sweet orange.